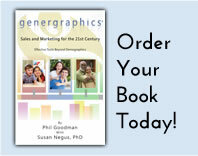 Genergraphics® is a 25-year compilation of generational research, case studies and defined statistics that has enabled Fortune 500 companies to better understand their own market positions. Generation Miner©, created by Charles Schwartz, is a suite of tools that joins the power of Genergraphics and behavioral research with generational marketing. Contact Genergraphics to learn more about our research programs including the GenMiner© process and how we can help you better understand your customers and their mindsets. *Genergraphics® improves the accuracy of hitting your target market in advertising and marketing from 30% to 70% over using demographics. *The following chart details each of the Five Generations. *The following chart shows factors that distinguish Boomers from other Generations. *The following chart shows factors that distinguish the Silent Generation (aka Forgotten Generation) from other Generations. *The following diagram compares the different characteristics amongst Echo Boomers (born 1977 and later), GenX (1965-76), Trailing Edge Boomers (1960-64), Leading Edge Boomers (1946-1959) and the Silent Generation (1936-45). * The following chart shows the media generation gap between various age groups from 18 and up. Trends show a decline in TV News viewing and Newspaper readership among the younger generations.